When you run a business in Greensboro, High Point, Burlington, or Eden, heat or air conditioning problems impact many people. A comfortable environment is necessary for both employees and customers. When your air conditioning goes out on a hot day, it can become unbearable inside very quickly. Berico responds quickly, restoring your building to cool comfort as fast as possible so that you can continue to do business. If your business does not have heat on a cold winter day, it may be unsafe for employees and customers. Berico will repair your heating system and have your building feeling warm and toasty again in the least possible amount of time. Properly maintained commercial HVAC systems enable your business to run smoothly by giving your employees and customers a comfortable environment, which is proven to increase employee productivity as well as customer satisfaction. After a rigorous inspection of your heating and air conditioning systems, the technicians at Berico will know all the requirements of your facility. The size and type of necessary equipment will determine the services provided. Berico takes pride in taking care of your business by cleaning up after scheduled maintenance appointments and making sure there is minimal downtime for your business. To keep your system running at maximum efficiency and to prevent costly repairs, annual maintenance is recommended for your commercial heating and air system. HVAC maintenance will help you to maintain optimal air quality in your business and maximize comfort. Every business is unique in heating and air conditioning needs, and Berico provides customized commercial heating and air installations. Your new system will be sized correctly for your facility’s layout, insulation, and heating and cooling requirements. 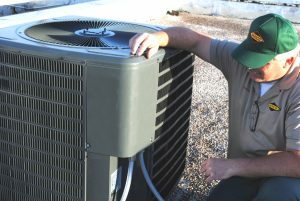 Proper installation is crucial to the performance of your HVAC system and its overall lifespan. Berico has fully certified technicians that will meet with you to discuss your budget needs and HVAC requirements so the proper equipment can be installed. Berico carries EnergyStar® HVAC systems that will help you to save money on your utility bills. For a complete evaluation of your commercial HVAC installation options and a free estimate, contact Berico today in Greensboro and High Point: (336)273-8663, Eden: (336)623-9741, or Burlington: (336)226-9371.